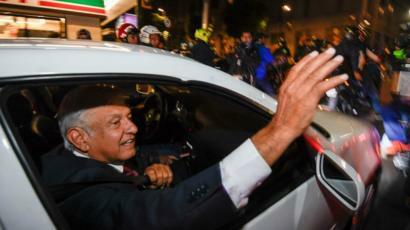 Left-wing candidate Andrés Manuel López Obrador is heading for a clear victory in Mexico’s presidential election. Electoral officials said a quick count after Sunday’s poll indicated the former mayor of Mexico City had won with about 53% of the vote – more than double that of his nearest challenger. 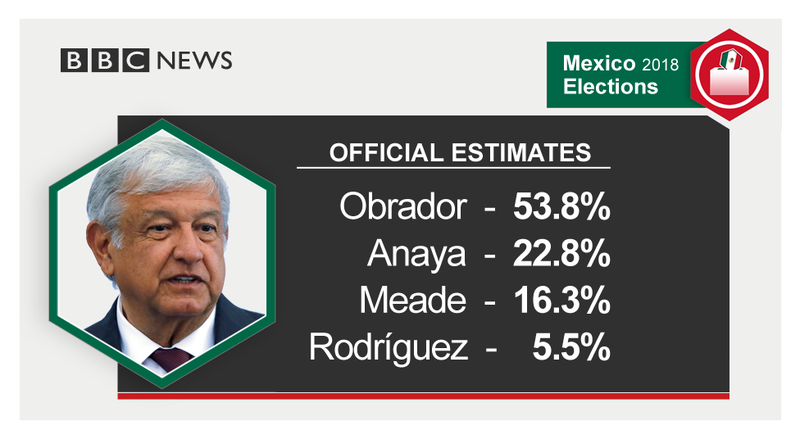 Exit polls also put Mr López Obrador, known by his initials Amlo, well ahead. 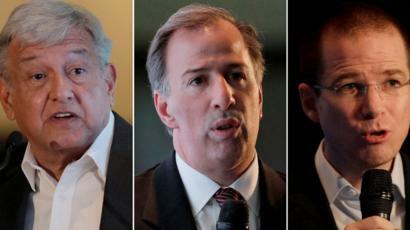 Ruling party candidate José Antonio Meade, who lies in third place according to initial results, told supporters that he wished him “the greatest success”. Mr Meade’s Institutional Revolutionary Party (PRI) has dominated Mexican politics for much of the past century but has slumped in popularity. Ricardo Anaya, candidate for the conservative National Action Party (PAN), looked set to be runner-up to Mr López Obrador. “I recognise his triumph, I express my congratulations, and I wish him the greatest success for the good of Mexico,” Mr Anaya said. How has Mr López Obrador reacted? In his first public comments following the election, Mr López Obrador said that eradicating corruption and impunity would be the primary mission of his administration. He also said he would seek “friendship and co-operation” with the United States. Relations with Washington have been strained since the election of President Donald Trump who has strongly criticised Mexico over trade and migration. However, Mr Trump took to Twitter on Sunday to congratulate Mr López Obrador “on becoming the next president of Mexico”. Sunday’s election followed one of Mexico’s deadliest campaigns in decades with more than 130 political candidates and party workers killed. 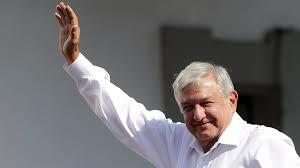 Delivering early and clear acceptances of their defeats, the two main challengers have recognised Andrés Manuel López Obrador as the winner of the presidential race. On a tough night for the ruling PRI party, their candidate, the former economy minister José Antonio Meade, conceded first after polls closed. Next, and even more significantly, the other main rival, Ricardo Anaya of the PAN party, also recognised Mr López Obrador’s victory. The official results must still be published for the margin of the win to be confirmed but this is a night that Mr López Obrador and his supporters have been waiting for since 2006 – the first time he stood for the presidency in Mexico. Now, on the third attempt, he has finally taken it and, in so doing, redrawn the political map of the country. Mr López Obrador has been runner-up in Mexico’s two previous elections but now seems likely to end the dominance of the PRI and the PAN. He has referred to them as being part of the same “mafia of power”. Many Mexicans have grown disillusioned with incumbent President Enrique Peña Nieto’s PRI administration, particularly over the sluggish economy and endemic corruption. Mr López Obrador, 64, put tackling corruption at the centre of his election campaign, promising to improve wages and pensions by stamping out rampant abuse. His opponents tried to paint him as a populist who cannot be trusted with the economy. How did election day unfold? Long queues of voters formed outside schools and community centres as polling day progressed but two more killings of party members were reported – one a member of the Workers’ Party in the western state of Michoacan and the other a member of the governing PRI party in the central state of Puebla. About 88 million people were eligible to vote not only for a new president but also 128 senators and 500 deputies in Congress as well as state and local officials. Preliminary figures put official turnout at just over 60%. A huge crowd gathered outside the polling station in Mexico City’s Tlalpan district to watch Mr López Obrador cast his vote. How will US-Mexico relations be affected? Mr López Obrador has been the candidate most critical of Donald Trump and has said he will make the US president “see reason”. Mr Trump has riled Mexico by saying he will renegotiate the North American Free Trade Agreement (Nafta) and build a wall along the US-Mexico border. His hardline stance on migration – particularly the separation of migrant families at the US border – has brought widespread condemnation.